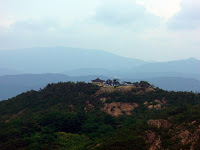 I travelled to 경주 (Gyeongju, South Korea) for the second time on 22 May 2009 to visit 불국사 (Bulguksa temple), which is a UNESCO world heritage, and hike at 남산 (Namsan) with Olga and Yerbol, two friends studying in the region. Clouds hovered over the region but the weather remained pleasant. I appreciated the local historical assets and traditional ambiance but was surprised by the distances: one may see much with a bicycle in two days. However, I was slightly disappointed as I expected older, bigger and more numerous touristic sites because several Japanese friends had compared the city to 京都 (Kyoto, Japan); Koreans indicated that the area would be markedly more attractive had Japan not damaged or destroyed so much during wars and occupations... From another perspective, I also enjoyed unique coffee shops, delicious restaurants and, as we kept on bumping into acquaintances of Olga and Yerbol, a countryside atmosphere in which all people seemed to know each other. The air, ambiance and smaller crowds agreeably contrasted with my everyday life in 서울 (Seoul, South Korea). For newcomers, two or three full days seem appropriate to discover the historical sites and enjoy the city, with one or two additional days for hikes. I will gladly return there to complete my visit and explore 남산 (Namsan) from another side.